Be the first to share your favorite memory, photo or story of Carrol. This memorial page is dedicated for family, friends and future generations to celebrate the life of their loved one. Carrol F. Leonard, 83, of Parsons, died at 2:14 p.m., Sunday, March 24, 2019 in Parsons at the home of her daughter, Kathy with she, her son, Doug, and granddaughters, Heather and Jessica by her side. She was born June 22, 1935 in the state of Fargo, North Dakota and lived there in her early years. As a young teenager she came to Erie. On February 27, 1950 she and Donald E. Leonard were married in Parsons and established their home here. Don preceded her in death on December 1, 1997. 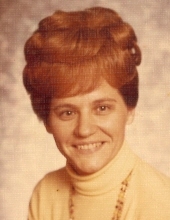 She was an accomplished seamstress and enjoyed quilting and gardening. She was employed several years at the Broderick Company. In past years she had attended the First Assembly of God Church. Carrol is survived by a son, Douglas E. (wife Gil S.), of Destin, FL, two daughters, Judy Myers (husband Neal) and Kathy Knight (husband Kevin Mateer), both of Parsons; several grandchildren and several great-grandchildren. A daughter, Donna Hughes, preceded her in death. Funeral services will be at 2 p.m., Wednesday, at the Memorial Lawn Cemetery Patio, with Chaplain Wayne Mason officiating. The Carson-Wall Funeral Home is in charge of arrangements and friends may call at their convenience. Memorials are suggested to the Harry Hynes Memorial Hospice, They may be left at or sent to the funeral home at Box 942, Parsons, KS 67357. To send flowers or a remembrance gift to the family of Carrol F. Leonard, please visit our Tribute Store. "Email Address" would like to share the life celebration of Carrol F. Leonard. Click on the "link" to go to share a favorite memory or leave a condolence message for the family.